And the truth is you will need a dramatic encounter in some form if you are going to get financially real. I had one and so did the others you see in the “We Are Financially Real” image. We all reached a moment where we understood there was a better way to handle money. Here’s what drove me to that realization. You can’t change your habits unless you first see an issue. And even if you see the issue it will be difficult to move forward unless you believe change is possible. Around 2008 I started to see the issue my wife and I were having with our spending patterns. However I wasn’t committed to change. I thought our finances would eventually just work out as we advanced our careers and made more money. I’d heard that verse before but this night it stood out to me for some reason. It’s as if the verse was shouting out to me from the pages of the book. I sat there for the next five minutes thinking about what this verse was saying. Did I really want to continue a lifestyle where I relied on the credit of others to support myself? Was I content to stay in debt and accept that it was the only way to manage life? Was I being a good steward of all my resources? a) I didn’t want to be poor or even come close to it. A life of overspending could lead me in that direction. b) I didn’t like the idea of being out of control. c) I didn’t like someone else (the rich or the lender) being in charge of my financial destiny. Mostly though I didn’t like my laissez-faire attitude about money. It was just the spiritual insight I needed to kick-start my process of change. It wasn’t hard for me to take that insight and turn it into belief that I could pull it off. We were not in extreme debt, had good salaries and had a financial buffer with our investments. So any of the barriers that hinder others were not present for my wife and I. The challenge for me would be in having the discipline to implement the necessary changes to succeed. Could I do it? At the time I wasn’t sure. As I found out that’s where the rubber meets the road. My mind was made up in five minutes that night that we were going to change. My pain threshold had been reached. I was sick and tired of living the way we were. But belief wasn’t enough alone. I had to act. Once I began to act on my insight and belief that we could change I became more committed to it. We took steps to change our financial lives including cutting up our credit cards, starting and following a budget and reducing all non-essential spending. I even had an experience while shopping for shoes that I believe altered my spending patterns forever. It was my “drawing-the-line-in-the-sand” moment. Funny thing about commitment though is that we have lapses. Commitment involves our emotions, mind and will working in conjunction with one another. Usually once our will is involved we are more likely to follow through on a commitment. But sometimes wills are fragile. They can be broken by the toughest of circumstances. So what kept us going during the tough times of our transition to a new way of handling money? It all goes back to the five minutes I spend thinking that night. You see, I just didn’t have some insight that night and act on it. I had been spiritually convicted about a damaging behavior I was inflicting on my family. You may think that odd – that God would speak to me about money. I know it happened and it was personal. Conviction is step beyond belief or commitment. In essence a conviction says, “I am ready to die for my commitment.” When you have a conviction, that thing you believed now has become a passion in your life. You eat it, sleep it and you live it…every single day. You are ready and willing to go to extreme lengths and sacrifice at great personal cost. I don’t know where that conviction will come for you. Mine was spiritual in nature, coming from God speaking to me as I read the Bible. You’ll have to find your own way to reach such levels of passion. But you will have to go that deep in order to pull this money thing off. Start getting financially real today. Turn your insight into belief. Let belief well up into conviction. And your financial life will never be the same. Questions: What moment led you to get financially real? What was the hardest part of turning your financial life around? I love this post, Brian! The part about conviction versus commitment really spoke to me. And I needed to hear that message. I realize now that one reason that I’ve been struggling so hard lately is because I lack conviction. I want to accomplish my goals but there are still seeds of doubt that hold me back. I need to believe in myself and act with conviction. It’s what I’ve been lacking, so thank you for this very timely post! It’s a fine line between commitment and conviction. Commitment has value…I just see conviction being a deeper level of commitment and a place you have to get to for real, lasting change to occur. Glad this helped Tanya and best of luck moving forward. I was raised to be frugal, so mainly it was a case of turning my husband around. I just showed him that we could, in fact, get rid of his defaulted student loans. It took awhile, but once he started seeing progress, he fought the money restrictions a lot less. But you’re right, there are always lapses. It’s human nature. If for no other reason, our brains can literally only handle something like 5 priorities at a given time. Anything more than that gets pushed to the side temporarily. I think what’s important when that happens is to assess what went wrong, in case you can avoid it in the future. And to not beat yourself up about it. Even if it was completely unavoidable, you can’t undo it. You can only try to do better in the future. And wasting energy castigating yourself is just a waste. It took me awhile to get that, but my husband’s ADD made it a vital lesson in our debt payoff journey. “…our brains can literally only handle something like 5 priorities at a given time. Haha…I know exactly what you mean. Any more than that and I get overloaded. Thanks for sharing those insights! I’ve heard that verse so many times but never really thought about what it meant. I guess sometimes me are looking at the answer and don’t see it. The Book of Proverbs freaks me out because it has so many proverbs about money that are SO RIGHT!! “I’d heard that verse before but this night it stood out to me for some reason. It’s as if the verse was shouting out to me from the pages of the book.” When that realisation kicks in that things MUST change, it certainly has an impact! I can relate because although I didn’t receive a spiritual message like you did, I reached a point where I was convinced all the same that paying off debt had to happen and I knew I would make the necessary changes to get there (eventually)! Everyone comes to it their own way. But to ignore “the voice” inside would have been foolish. “When you have a conviction, that thing you believed now has become a passion in your life.” Love that, Brian. It’s true, you have to have conviction. To believe you are worth it and achieve it. I meet a lot of people who want financial freedom but they lack they conviction. They don’t think they can do it or are not ready to do the work. And you’re right – sometimes we need to hear things over and over and one day we’re ready to listen. I’m glad you listened and took action, Brian! Thank you again for your participation in the carnival. I truly appreciate your support. These carnivals are a lot of fun. I enjoy reading what the other participants write about. Makes you realize we all come to action/change in different ways and that’s just fine. Great job on setting this up…hopefully the message was well received by all those who read the blogs today. It really hasn’t been that hard to turn my finances around. I was just clueless of what I had to do and where my money was going. All I had to do was pay attention and track my finances. I wish I could say it was more difficult that that, but that just wasn’t the case for me. “All I had to do was pay attention and track my finances.” It doesn’t have to be difficult. I think you should be grateful your transition went smoothly. No need going through trial if you don’t have to. I think the hardest part is turning a belief into action. I don’t believe anyone wants to be in debt and living paycheck to paycheck, but it takes tons of effort and sometimes a whole shift in ways of thought to really make changes. I’m not sure why we can read or see or notice messages a million times before they finally take hold, but I guess if you are looking for a way to change, maybe they take on a new and more urgent meaning. I go back and forth on which is harder – the believing or the implementation. The steps to improving your finances are easy to understand but do take effort to practice. The believing is tougher to summon but once you have it you have it and can move. Perhaps it depends on your circumstances and how down and out you are to start with. I hate not being in control and for someone else to be in charge of my financial destiny. I remember your post about the shoes. It’s weird what situation it will be but it’s at that moment that you realize that you can’t continue going down that path and you take back control. I never would have anticipated learning such a lesson while shopping for shoes. But those moments when you draw the line are very powerful. It literally broke my old (not good) way of thinking about spending. LOVE this post, Brian! “My mind was made up in five minutes that night that we were going to change. My pain threshold had been reached.” <– These two sentences are my favorite because they touch on something so great. Sometimes, you need to be "pushed into your purpose". And it takes great pain to realize that you need to make a change. Without that type of pain; without being pushed to your pain threshold, it's unlikely that you would make a lasting change. I don't think we ever know how we'll react when pushed further than we've been pushed before. Whether it's money or something else. That said, it's so powerful, particularly if you're a Christian, because you can view it as God helping you make tough choices and living the life He created for you. Thanks Natalie! I really believe people won’t change (in any area of life) until they suffer pain. I wouldn’t wish pain on people, but I think it’s the most potent factor that moves us forward. Once I decided that financial freedom over retirement was the choice for me, I began to get financially real. I realize now that I wasn’t financially real in the past because I never had a concrete goal like financial freedom. I was making money choices every single day without a specific goal and that only led to years of being financially lost. Three years ago I made the change and ever since having this goal, all of my other financial choices seem to make more sense. “…financial freedom over retirement…” That’s real good insight Shannon! I don’t believe retirement should be the end goal. If it is, you get to retirement and then what? You may have 30+ years yet to live. And if you haven’t created a nest egg at that point then those years are going to be very difficult to manage. Thanks for sharing, Brian! 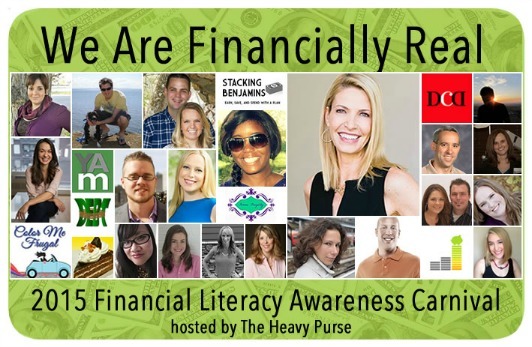 It definitely isn’t easy to become financially literate. It’s even more difficult to put a plan into action and make tough decisions that benefit your long-term financial health. Student loan debt is the biggest thing “hanging over my head” and the thing that motivates me to work hard to increase income that can be used to pay it off. So I guess my moment was when I totaled up how much was going out the door each month from loans! The student loan burden is very real. If there is one thing I plan for my kids to avoid it’s this. It can really hamstring people for much of their adult life and reduce the choices they can make. Great story, Brian! I think the hardest thing for us to get real with our finances was believing we could. When you only make X amount of income every month its kind of hard to believe that you could ever build a fortune of one million dollars or be all set for retirement one day. But then as we started digging into “how” to get there, that also became the exciting part. We realized that all of things weren’t just success stories but actual roadmaps for how to get there and become one of the lucky ones. “…believing we could.” I tend to agree MMD. The nuts and bolts of the process aren’t really that hard to understand or implement. It sounds to me that you wanted to get your finances under control so that you could be in control of your life. I think that’s awesome! We had a similar journey in that we finally realized that we weren’t reaching our potential and wanted to do something about it. That’s true Holly. I wanted to be in control of the things I could be in control of. So much is out of our control and I try not to worry about those things. I love that verse. Boy have we felt the truth of it! We’ve had several “getting real” moments financially, but the most recent and probably the most painful was just recently when my hubby had to turn down a job he really wanted in a location that we really wanted to move to, all because of debt. The job entails a lower salary, and we decided that we just can’t take that kind of decrease in pay until we get our debt paid off. The silver lining is that now we are even more motivated to annihilate our debt! Once we do that, it will free us to take opportunities we want, since we won’t have the ten ton anchor of debt around our necks. Can’t wait for that day! Very impressive Brian. Being financially real requires commitment and bravery because when you do this you have to be mentally prepared so that you can turn your situation around because this initial phase I suppose must be the hardest part. Nice post Brian.